Celluloid Nightmares: Horrorella Kicks Off October with a Viewing of WHITE ZOMBIE! Welcome to CELLULOID NIGHTMARES! This is a special project that I cooked up and will be delivering weekly though the month of October as a means of examining some overlooked early horror gems. As Halloween rolls closer, I always dive into the furthest reaches of my DVD collection and pull out every badass terror flick I can find. New films, old favorites – the month of October is always a viewing extravaganza. But my picks always tend to be focused on more modern fare. As much as I adore the Universal classics like Dracula and Bride of Frankenstein, and consider them undisputed film masterpieces, I confess they are not as much a part of my yearly rotation as HALLOWEEN, or ROSEMARY’S BABY or TRICK ‘R TREAT. And there are even more that I have never seen. I figured this situation was not unique to me, so I thought it might be fun to spend October discovering some of these older horror entries. Throw a little black and white in to the viewing mix, and hopefully discover some classics that we might not be aware of. And if these films are already part of your viewing tradition, maybe we’ll be taking a look at some of your favorites along the way. 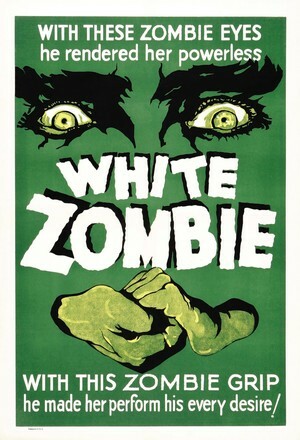 So to kick things off, I went with an early film that, while not initially well-received, has gone on to become an appreciated classic and an important note in horror history, WHITE ZOMBIE. Written by Garnett Weston and directed by Victor Halperin, critics initially decried the film for having a ridiculous plot and for the poor performances, but the modern era has led to the film being embraced in a new way. As it happens, there is a lot here to appreciate, and it is a very worthy selection for Halloween viewing. WHITE ZOMBIE is credited as the first zombie film. Which is awesome in and of itself, but it’s doubly cool because the zombies in question are the traditional Haitian zombies, as opposed to the more common (and beloved) flesh-eating corpses that Romero popularized with Night of the Living Dead. These zombies are created through a magical powder, and controlled by a bokor - a powerful, dark Voodoo practitioner. The victims are dosed with this powder, presumed dead and are buried. They are later awakened by the bokor, a lifeless shadow of their former selves. Basically, everything you see in THE SERPENT AND THE RAINBOW, minus the creepy Wes Craven nightmare effects. 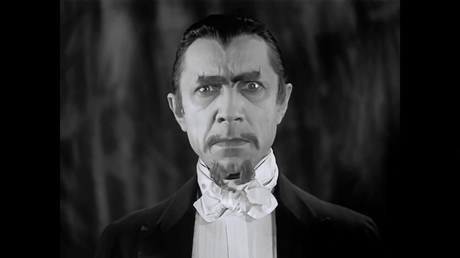 Here, Bela Lugosi stars as the bokor in question. A wealthy plantation owner named Murder Legendre (best evil villain name EVER), living in Haiti and commanding a workforce comprised of the zombified remains of his former enemies. It’s really a great (and dastardly) way to take revenge, if you think about it. Our story begins with the arrival of Madeline (Madge Bellamy) and Neil (John Harron), young lovers traveling to the nearby home of Mr. Beaumont (Robert Frazer) to be married. Beaumont’s kindness and welcoming of the couple is not completely selfless, however, as he has fallen in love with Madeline and is hoping to win her affections before the wedding can take place. He enlists the powerful magic of Legendre. When Madeline refuses his proposal (as he is walking her down the aisle, by the way – class act), he slips her some of the zombie powder and she collapses shortly after the ceremony, leaving a wilted, grieving groom behind. She is buried, and while Neil mourns her passing, Beaumont and Legendre break into the tomb and revive her. She returns to Beaumont’s home, a wide-eyed lifeless doll. The story doesn’t end there though, as Legendre has ulterior motives, having falling in love with Madeline himself. He is committed to conquering Beaumont and keeping Madeline as his prize. 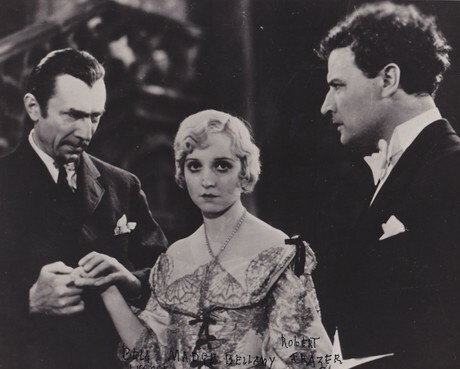 The acting isn’t stellar, and is a big part of what keeps it from being considered on the same level as many of its contemporaries, such as DRACULA or BRIDE OF FRANKENSTEIN. Much of the delivery is stilted and awkward, resulting in moments that don't quite hit the emotional resonance they could. Lugosi is the only performer who really stands out. He is certainly able to put his Dracula methodology to good use in this story, which requires a strong and intimidating presence, as well as one of the best thousand-yard stares out there. His Legendre is an imposing figure, first warm and inviting, before turning on a dime and becoming nothing short of menacing. Like in DRACULA, much of his performance is delivered through his piercing, hypnotic gaze, as he crafts a commanding character that steals the film. But what WHITE ZOMBIE lacks in performance craft it more than makes up for in atmosphere. This is a film you feel from the moment the opening credits role. Halperin makes great use of shadows throughout, creating a dark and wild landscape that sets the stage beautifully. The story itself is very much a dark, horrific fairy tale, and the shadowy fields, imposing cliffside castles and cavernous interiors all contribute to a very haunting mood present throughout the film. Setting aside the obvious racial and misogynistic implications at play throughout the film (and they are plenty), it’s really an interesting entry into early horror. The introduction of the zombie into horror cinema is a cultural touch point in and of itself, as is an examination of the way the creature has changed over time, going from its Haitian origins to the walking dead of today’s pop culture. The zombie has certainly come a long way, and its current incarnation has long since left its Voodoo roots behind. The film may not be as affecting as many of its contemporaries, but it has definitely earned a place of respect among early horror pictures, thanks, in large part, to the performance put in by Lugosi. Over the years, WHITE ZOMBIE has become a classic in its own right, and is very deserving of examination, particularly as we gear up to celebrate Halloween and are looking for unexplored dark and twisted tales to share on October nights. In fact, since the film is now in the public domain, you can feel free to view it at your leasure - Enjoy!